An excellent article entitled “Plague Masks: The Visual Emergence of Anti-Epidemic Personal Protection Equipment” written by Christos Lynteris has just been published in the journal Medical Anthropology (2018). Through the invention of masks to protect the respiratory tract against infectious agents, in this case the plague microbe, the author shows us that these devices can also influence behaviour and have a significant social impact. We will not talk about the ancient plagues that are very difficult to understand because of the lack of scientific data. Moreover, at that time, all epidemic phenomena were called “plague”. The 1st pandemic (541-767) or Justinian plague reached Egypt, Ethiopia and the Mediterranean basin). It was described by Procope of Caesarea. The 2nd pandemic or black plague (1346 – 1828) presented many resurgences. It was active in Lyon in 1628 and Marseille in 1720, and the third pandemic is still ongoing. Begun in Hong Kong in 1894, it left bad memories in Paris in 1920 with the so-called “plague of ragpickers”. These different pandemics are in Yersinia pestis. This bacterium is currently considered a potential biological weapon. Plague is a disease of rodents (rats, squirrels, marmots, gerbils). The bacterium is transmitted to animals by a flea, man being regularly outside the natural cycle. It is when rats die in too many numbers that fleas in need of food attack humans and transmit the disease to them. There are 3 forms of plague; the most common is the “bubonic” plague, the bubon being the inflammation of the lymph node of the territory where the bite occurred; the septicemic plague resulting from the transmission of the bacterium directly into the blood system and the pulmonary plague during which the flea does not intervene, the bacterium passing from one man to another directly by air giving a devastating disease. The 3rd pandemic began in China in 1894 and this is the first time it has reached all 5 continents. In 1910 and 1911 it killed more than 50,000 people in Manchuria. This plague was very particular in that it had a 100% mortality rate and that clinically it was characterized by the only airborne pneumonic form, therefore without flea intervention. On the other hand, at that time, there was a geopolitical struggle between the Chinese, Japanese and Russian empires that controlled the different regions of Manchuria. The Chinese Imperial Court has appointed Wu Liande as responsible for the fight against the plague. Putting himself in the scientific context of the time, Yersin had discovered the responsible bacillus, Yersinia pestis, in 1896 and Dr. Paul Louis Simon had just demonstrated in 1898 that the chip removed infectious agents from rats before transmitting them to humans through its bites. This theory was widely accepted by the scientific community. Therefore, in view of this exclusively pulmonary clinical form, Wu Liande had difficulty in making it clear that the spread of the disease in this particular case did not require non-human vectors but was transmitted directly between individuals by the airborne route. This theory was then very bold because it contravened the recently adopted rule. However, it has developed anti-epidemic technology in the form of an antipesta mask. It was very similar to the surgical protective masks used since 1897, but it consisted of thicker layers of tissue and a complicated attachment system designed to hold it in place on the mouth and nose while remaining effective in the harsh winter conditions of Manchuria (-40°C). This mask was worn by doctors and other medical and paramedical personnel in contact with patients or corpses. It was also intended to be worn by patients, or even the entire population concerned. This is the first time such prophylactic measures have been implemented, they were replicated during the 1918 influenza pandemic. His theory of airborne disease transmission was then highly contested, in particular by the French plague specialist, Dr. Gérald Mesny, a colonial doctor. According to Wu, Dr. Mesny operated on infected patients in the hospital without wearing a mask. He contracted the disease and died of the plague in 1911. This led to the universal adoption of Wu’s pulmonary theory and the adoption of his prophylactic device by the entire street population. In April 1911 an international congress on the plague was held in Mukden. The different theories on the spread of the disease and on the measures to be taken to curb the epidemic were discussed in order to determine which of the 3 empires, Chinese, Japanese or Russian, could provide the most modern solutions to govern Manchuria. Wu presented a photo album entitled “Views of Harbin” containing 61 photographs taken during the outbreak and showing all Chinese efforts to control the disease. The result is striking because of the 47 pictures representing humans, 230 of them carry the anti-epidemic mask. Individuals are not hidden by their masks but on the contrary they are enhanced by creating a sense of a united front against the disease. In addition, the white masks were clearly detached from the sepia background of the images suggesting a new notion of hygiene. Through his masks and their staging, Wu showed that China had entered into hygienic modernity, which certainly played a role in maintaining China’s supremacy over Manchuria. Of course, Wu did not have a exclusive monopoly on anti-epidemic protection. 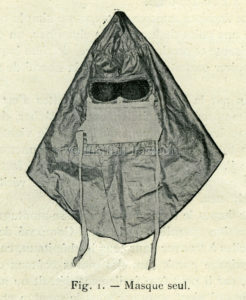 During the Mukden congress two other types of masks were presented: the so-called “Mukden mask” used by the Japanese and proven ineffective against bacteria by a laboratory in 1912 and the so-called “Broquet mask” (Charles Broquet, French Pasteurian doctor) unused because it was too difficult to use. 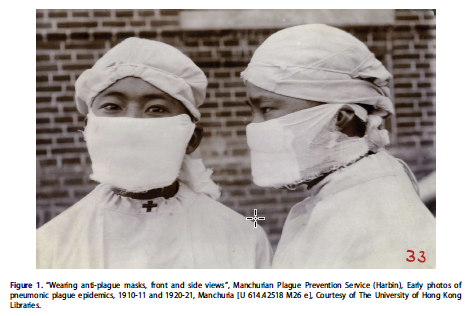 It is undeniable that the wearing of masks during the Manchurian plague helped to stop the contamination by preventing the germ from spreading by air (we now know that this type of transmission is very real). The wearing of masks, adopted by the entire population, has also made it possible to transform an ignorant and superstitious population into an informed and hygiene-conscious one. This simple system has therefore functioned on 3 linked and inseparable levels: 1- the means to stop the epidemic, 2- the undeniable photogenic proof of Chinese scientific sovereignty, 3- the transformer of the Chinese people into a population in the biopolitical sense of the term, i. e. the target of concerted action by the common power on all subjects as living beings and no longer by considering only the territories.